Restore production from your well faster with the industry’s most effective, safe, and reliable vessel-based well stimulation solution. We developed the industry’s first subsea rigless stimulation system and have performed dozens of successful deepwater interventions since. You will benefit from tailored, project-specific solutions built from our suite of products and services, including vessels, engineering analysis, intervention tooling, remotely operated vehicles (ROVs), and project management expertise. We restore production from your well faster and more cost-effectively by Connecting What's Needed with What's Next™. Our production enhancement experts deliver complete project management, engineering support, and offshore service to ensure fully integrated, successful stimulation operations. 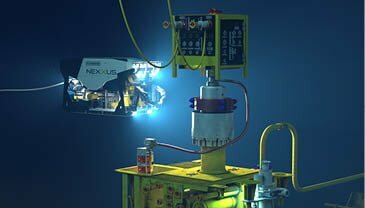 We help maximize flow and protect your subsea assets by safely and effectively remediating production-reducing damage mechanisms. We work with you to develop the best stimulation plan for your reservoir—from front-end engineering and design (FEED) studies to the development of an operability matrix. Even in the deepest waters, we remediate migrated sand and remove scale, wax, paraffins, and asphaltene formations to restore a positive productivity index. We have successfully stimulated subsea wells in up to 6,700 ft (2,042 m) of water. Our industry-leading portfolio of subsea intervention tooling—including our proprietary well stimulation tool (WST) and rapid access tool (RAT)—provide reliable access to your wellbore. Unlike traditional rig-based well stimulation systems, ours does not require the use of a blowout preventer (BOP)—we ensure safe operations by providing a double barrier for well control. Our WST features redundant disconnect systems with spill-proof connections—an emergency quick disconnect (EQD) system ensures that the vessel can detach from the wellhead with zero leakage. Our EQD can be actuated on-command from surface, or automatically subsea in case of unexpected pressure increases. By using an Oceaneering vessel or a vessel of opportunity, we reduce overall project costs by as much as 50%, and deliver solutions when and where you need them. The relative ease with which we can mobilize our systems is especially significant during multi-well stimulation campaigns. 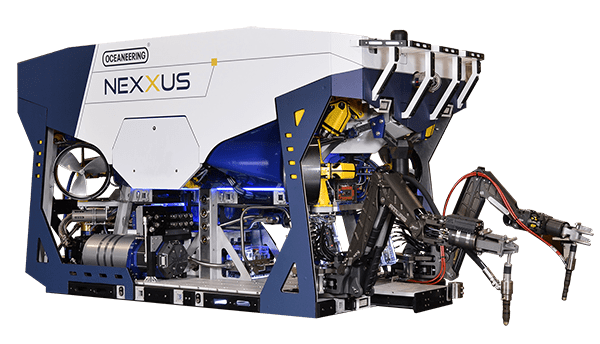 Our MSVs are ready to solve a range of challenges with onboard ROVs, subsea heave-compensated cranes, built-in chemical storage (5,000 bbl), fire suppression, high-horsepower pumping, dual open water coiled tubing risers, and flying leads. We achieve pumping rates up to 15,000 psi at 20 bbl/min, and can address multiple treatment stages. We ensure that, when there is not sufficient room to store pre-mixed chemicals onboard, we are prepared to mix chemicals on the fly. We keep your operations on schedule and within the ideal weather window. With seamless topside pumping integration and remote control of your well, we provide the most effective stimulation possible. We ensure that you have the access you need to properly dose acids, solvents, or diverters—in a matter of hours or days, not weeks. Read our latest well stimulation articles in leading trade publications.